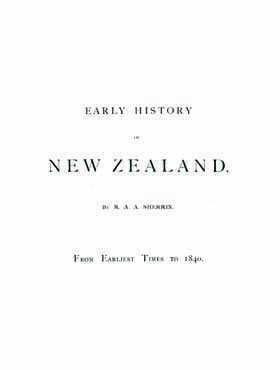 The Early History of New Zealand (R.A.A. Sherrin 1890), volume of extensive material and illustrations covers the history of New Zealand from the first contact by Europeans prior to Tasman through to Cook and the French in the late eighteenth century. The first section also examines the missionary and settlement period to 1840 in detail. The second part covers the period of British settlement from 1840. A very useful list of visitors and residents 1642 to 1839 is included along with their residence. A second list of the founders of the British Colony 1840-1842 is also included. Old historical records are a valuable resource for local, family and social historians as well as for researchers in other fields of Australian history. They provide information on the environment experienced by the residents of the time and how they lived, as well as their occupations. This is a great genealogy resource for anyone exploring their family history in New Zealand or building a family tree.